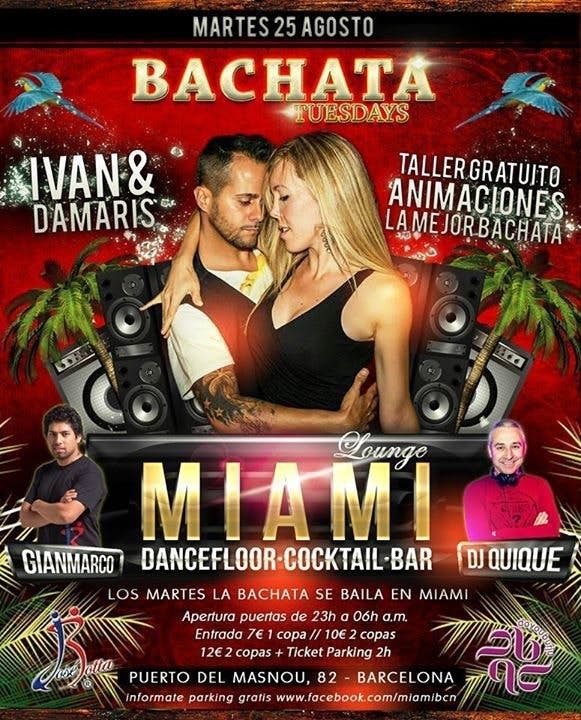 INAUGURAMOS MARTES DE BACHATA CON LOS GENIALES IVAN Y DAMARIS, EN CABINA EL GRAN QUIQUE AGUILAR DJ. Y LAS CRAZY ANIMACIONES A CARGO DE GIANMARCO. TALLER GRATUITO DE BACHATA CON IVAN Y DAMARIS A LAS 23:15 H.
A CONTINUACÍON LA MEJOR SESIÓN MUSICAL A CARGO DEL MAESTRO QUIQUE AGUILAR. AMBIENTE SELECTO CON GRANDES SORPRESAS DE AMIGOS ARTISTAS! TICKET DE PARKING 2H CON TU ENTRADA! PUERTO DEPORTIVO EL MASNOU LOCAL 82-82, 08320 EL MASNOU.